This is the continuation of The Mystery of Bananas – Conversation I & II. Last time I mentioned that it is not a smart idea to eat bananas with an empty stomach as it does not do any good to your heart nor your stomach. This time I am going to share with you another random conversation I had with someone about bananas. Well…since “the doctor said so”, I thought it would not hurt to give it a try. I suppose Mrs W’s family doctor probably does not have the intention to hurt Mrs W and her family. Even if he does, it would be rather stupid for a doctor to hurt somebody using the means of bananas. Surprisingly, after following Mrs W’s advice on eating a banana two hours before exercise, I could indeed sense that I was fueled up with energy and I felt more powerful and energetic than I used to. And here is the explanation for the mysterious power of bananas. Basically, there are three types of energy supply in your body: fats, proteins and carbohydrates. During your exercise, your body would first use up all the carbohydrates which is stored as glycogen in your body, and then will move on to fats and proteins. So logically speaking, in order to increase endurance during your workout, what you need to do is to fill up your glycogen stores beforehand. Bananas are loaded with carbohydrates which makes it the ideal food to eat before a workout. Having said that the idea is to fill up your glycogen stores before a workout, eating too much, however, will increase blood flow to the stomach instead of your muscles, which obviously is not a smart thing to do. 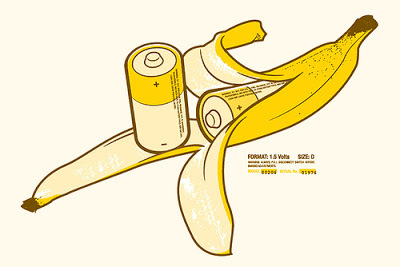 As for bananas, they have a relatively low GI (Glycemic Index) which according to WIKI (http://en.wikipedia.org/wiki/Low-glycemic_diet) it is used to quantify short-term changes in blood glucose levels in humans following the ingestion of carbohydrate-containing foods. In other words, foods that are quickly digested have a high GI, while foods that are digested more slowly have a lower GI. That is to say that eating low GI foods such as bananas two hours beforehand may improve exercise capacity as they will have left your stomach before you start exercising and remains in your body slowly releasing energy for some time afterwards.